Elk Grove mayoral candidates Tracie Stafford (left), Steve Ly, and Darren Suen. Last night the Elk Grove mayoral candidates Tracie Stafford, Steve Ly, and Darren Suen met for the second forum. This forum, sponsored by the Elk Grove Chamber of Commerce's political action committee, was held at the Cosumnes Community Service District's Wackford Center. The forum, which lasted about an hour and a half included a dozen questions, most of them submitted by the chamber of commerce. Give the chamber's focus, many of the questions focused on business and economic development in the city. 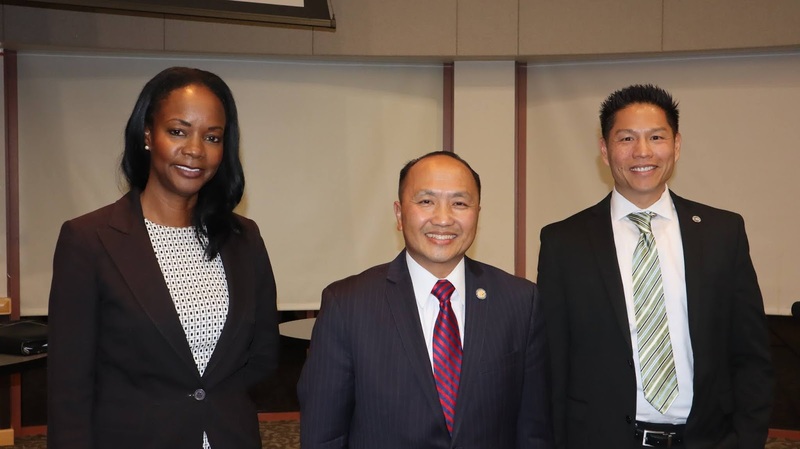 Although the forum covered very little new ground, there was one point in the conversation, especially between Ly and Suen, that revealed their differences as current members of the Elk Grove City Council. That point came during a question on cooperation between city council members. As a reference point, Suen has the endorsement of his and Ly's three council colleague and a majority of the Elk Grove Planning Commission. While Ly said he works well with his council colleagues and has met with others council colleagues on an informal basis outside official meetings to develop working relations, Suen offers a diametrically opposite view of intra-council dynamics. That portion of the conversation can be heard starting around 1 hour 8-minute mark of the recording until approximately the 1 hour 14-minute mark. Additionally, toward the very ending of the recording, in Ly's closing statement, he returned to the disagreement and offered another narrative.